-- making storage space a major consideration - a major cost! The concept of Mobile Storage - "Shelving on Wheels" - eliminates all those wasted aisles - reducing them to a manageable number, while still providing for the multiple access required by your application. A Systems Specialist from Penn Systems Group will survey your needs, provide you with professional layouts and configurations to assure maximum utilization of floor space in keeping with your special retrieval needs. Whether Manual, Mechanical or Electrical modules are required, Penn Systems Group specialists will recommend only the right system - tailored to your needs! Spacesaver Mobile Shelving Doesn't Waste Floor Space! 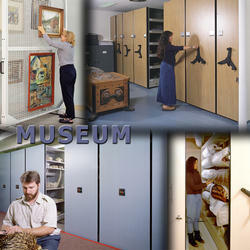 High Activity Storage Area combines fixed and movable shelving with multiple access points to speed retrieval time. 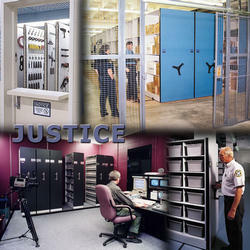 Low-Activity Storage Areas can be designed with a single access point to deliver the highest storage capacity. Traditional Storage methods waste 50% or more of valuable floor space on unnecessary, Non-Revenue producing access aisles. End Panels are available in 100+ decorator finishes to compliment any decor. A wide range of shelving options allows efficient storage of virtually any type of material. Double flanged five-inch wheels and self adjusting pillow block bearings maintain positive tracking and alignment. Full-length drive shaft prevents racking and friction which can occur with other movable shelving systems. Optional color-coded filing system reduces lost files and improves retrieval time by 90%. Moving a fully-loaded range requires less operator effort than it takes to open a filing cabinet. Positive safety mechanism allows occupied aisles to be locked open for operator protection. Multiple aisle openings provide easier access, speed retrieval time, and increase productivity.